If there are five words that have been overused to the point that they should be permanently retired from our community’s lexicon, they are “the island’s best-kept secret.” But when you find a fabulous winery, breaking new frontiers in the illustrious art and subtle science of wine making, hidden in an industrial park among HVAC repair shops, car parts stores and flooring wholesalers, what else can you call it? Yes, that thick industrial shell might be imposing, but follow that TripAdvisor reviewer’s recommendation and walk through that door and you’ll find yourself in a cozy tasting room surrounded by barrels that hold generations of winemaking expertise blended with a scientific pursuit of winemaking excellence. Every bottle of wine can trace back to the grapes that produced it, and those grapes, in turn, trace their qualities to the soil that produced them. It’s much the same with Island Winery. When Georgene and Loren met in college, they bonded, in part, over their mutual love of wine. For Georgene, that love had its roots in family tradition. “We’re a big Italian family, and making wine is just what we did,” she said. It was her grandfather who truly pursued it, and while it became tradition to gather around the family wine for meals and celebrations, Georgene always knew there was room for improvement. It was Loren who planted the seed that maybe she could make her own. An environmental consultant by trade, Georgene had a deep scientific grounding in several fields from geology to biology—fields that, it turned out, can be applied to the art of winemaking. Thus, by applying her scientific background to the fundamentals of winemaking passed down in Georgene’s family, the pair were able to open their first winery, Westfall Winery, on the Mortimer family’s farm in Montague, New Jersey. Another winery on Hilton Head Island followed. While Hilton Head Island doesn’t have the wine cachet of Napa Valley or the Finger Lakes region where the Mortimers first met, there is a surprising amount of wine tradition to be found here. And you’d better believe Georgene has done her research. In creating new wines to match the Lowcountry aesthetic and culture, Georgene once again went to the roots, to the long Gullah tradition of making wine with those ingredients that could be found growing locally. Just like with her grandfather’s wine, though, Georgene saw areas to experiment with and improve. She ultimately found that the sweetness of local honey tempered the bitter edge of the elderberries, resulting in a complex flavor profile and igniting a passion for new areas of exploration. Still, that experimentation is part of what makes this such an exciting time in Island Winery’s history. “Because we’re here full-time, we can do these unique small-batch items,” Georgene said. The grapes that form the foundation of Island Winery’s inspired offerings come from some of the finest wine-producing regions in the world. Thanks to a connection with a wine broker back in New Jersey, they can bring in grapes from all over the world: the famed Rieslings of the Great Lakes region; Zinfandels, Sirahs and other varietals from Napa Valley; Cabs and Malbecs from Chile. 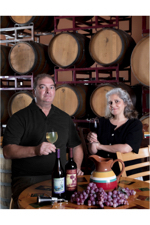 But just as Georgene used her scientific background to enhance her family’s winemaking tradition and take it in exciting new directions, the Mortimers have also been sure to ground Island Winery’s offerings in the Lowcountry. 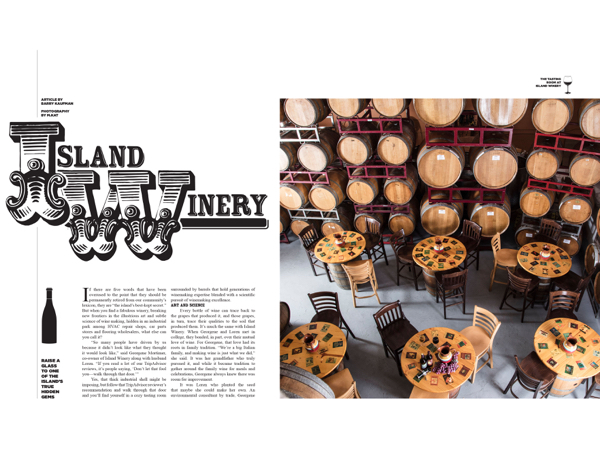 In addition to sourcing fruits and muscadines from area growers, Island Winery brings in local color in a much more literal fashion: Each bottle is adorned with works from local artists. More local art followed, such as a painting from Nicole Seitz adorning the Harvest White and a photo from part-time resident Kim Veon gracing the Peach on the Beach. “It almost gives the bottle a sense of being a souvenir,” Georgene said. And visitors have taken notice. So much so that the winery has continued to rack up accolades from TripAdvisor and other travel sites, while building a strong and loyal following of locals. You can find out for yourself what keeps bringing people back to discover the island’s best-kept secret (last time, promise), by either visiting the tasting room at 12A Cardinal Road, or by picking up a bottle at Carolina Tasting Room in Coligny Plaza.